This book examines in detail the early development of the game of football in and around Sheffield, England. When the first football club, Sheffield FC, was founded on 24 October 1857, it began a chain of events which would see the emergence of the earliest modern footballing subculture. It formed the beginning of a process which would lead to Association Football (or soccer) becoming the most popular team game in the world, and this primacy in club formation saw Sheffield, at least initially, develop into its most important element. 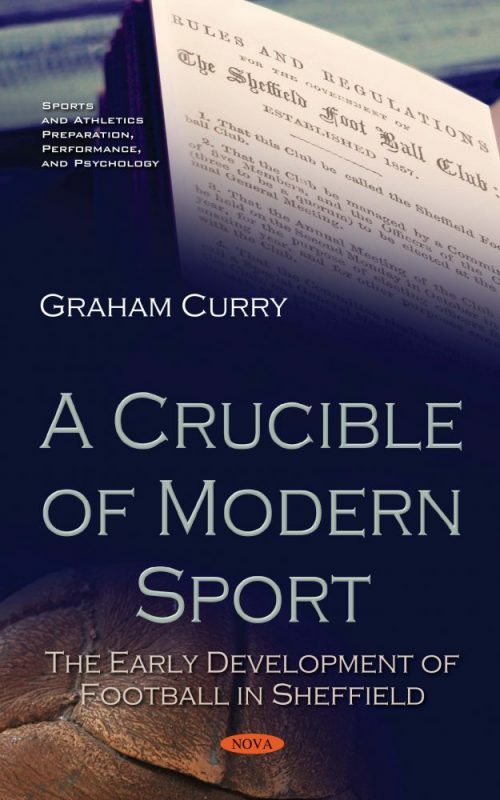 The central theme of the text, therefore, is an attempt to test various hypotheses related to possible reasons behind Sheffield’s pre-eminence in the growth of club football. These include influence from three areas of society: a nearby mob football enclave, the influence of former public schoolboys and a local sporting elite already established in cricket. The narrative considers other developments in the sport at that time – the relationship between Sheffield and the Football Association in London, the movement towards a generic code of football rules, emergent professionalism, the establishment of other clubs, playing patterns and spectator behaviour. Each of these components helps to form the basis for the ongoing progression of the game in the city and wider society. The text also relies on more than a modicum of sociological theory in the form of the figurational sociology of Norbert Elias, particularly making extensive use of his concept of power to explain reasons for the diffusion of football in Sheffield. Mention is also made of the concept of sportisation – the rationalisation and regularisation of games and recreations into their modern forms – as pioneered by Elias and Eric Dunning. The data have been subject to meticulous analysis and the book itself was produced through a process involving substantial academic rigour. Ultimately, this is a study which is long overdue, as writers on the history of football have previously tended to neglect the importance of Sheffield in the development of early football. Chapter 2. Why Did Modern Club Football Begin in Sheffield? Martyn D. Cooke, Manchester Metropolitan University, Department of Exercise and Sport Science, International Sport & Leisure History Research Team, England. To read the review, click here. Curry, G. ‘Playing for Money: James J. Lang and Emergent Soccer Professionalism in Sheffield,’ Soccer and Society. 5, 3, (2004): 336-355. Elias, N. The Civilising Process: The History of Manners. Oxford: Blackwell, 2000. Young, P. M. Football in Sheffield. Sheffield: Stanley Paul, 1962. Curry, G. ‘The Trinity Connection: an analysis of the role of members of Cambridge University in the development of football in the mid-nineteenth century,’ The Sports Historian, 22, 2, (2003): 46-73. Curry, G. and E. Dunning. Association Football: a Study in Figurational Sociology. London: Routledge, 2015.Derby Mercury. Dunning, E. Sport Matters: Sociological Studies of Sport, Violence and Civilization. London: Routledge, 1999. Dunning E. and K. Sheard, Barbarians, Gentlemen and Players: A Sociological Study of the Development of Rugby Football. Oxford: Martin Robertson, 1979. [Reprinted with an afterword on ‘The Continuing Commercialisation and Professionalisation of Rugby Union,’247-286. London: Routledge, 2005]. Hey, D. A History of Sheffield (3rd Edition). Lancaster: Carnegie Publishing Ltd., 2010. Farnsworth, K. Sheffield Football: A History, Volume 1, 1857-1961. Sheffield: Hallamshire Press, 1995. Goulstone, J. Football’s Secret History. Upminster: 3-2 Books, 2001. Harvey, A. ‘Football’s Missing Link: The Real Story of the Evolution of Modern Football,’ European Sports History Review, I (1999): 92-116. Magoun, F. P. A History of Football from the Beginnings to 1871. Cologne: Anglistische Arbeite, 1938. Marples, M. A History of Football. London: Secker and Warburg, 1954. Pybus, S. ‘Damned Bad Place, Sheffield’: an Anthology of Writing about Sheffield through the Ages. Sheffield, Sheffield Academic Press: 1994. Shearman, M. Athletics and Football. London: Longmans, 1888.Sheffield and Rotherham Independent.Sheffield Daily Telegraph. Sheffield Football Club Records, Sheffield Archive. Sparling, R. A. The Romance of the Wednesday. Sheffield: Leng & Co., 1926. Steele, J. A. The Countrymen: The Story of Hallam Football Club: The World’s Second Oldest Soccer Club. Chesterfield: Henry Boot Ltd., 1986. Swain, P. ‘The Origins of Football Debate: The “Grander Design and the Involvement of the Lower Classes,” 1818-1840,’Sport in History (2014), DOI: 10.1080/17460263.2014.882399. Vickers, J. E. A Popular History of Sheffield. Sheffield: Applebaum, 1978. Young, P. M. A History of British Football. London: Stanley Paul, 1968. Bell’s Life in London.The Collegian, 1881. Collins, T. ‘Early Football and the Emergence of Modern Soccer, c. 1840–1880,’The International Journal of the History of Sport, 32. 9, (2015): 1127-1142. Curry, G. ‘The Trinity Connection: An Analysis of the Role of Members of Cambridge University in the Development of Football in the Mid-Nineteenth Century,’ The Sports Historian, 22, 2, (2002): 46-73. Curry, G. and E. Dunning. Association Football: A Study in Figurational Sociology. London: Routledge, 2015. Curry, G. and E. Dunning. ‘“The origins of football debate” and the early development of the game in Nottinghamshire.’ Soccer and Society (2015), DOI: 10.1080/14660970.2015.1067801. Curry, G. and E. Dunning. ‘The Power Game: Continued Reflections on the Early Development of Modern Football,’ The International Journal of the History of Sport, 33, 3, (2016): 239-250. Curry, G. ‘Football in the capital: a local study with national consequences,’ Soccer and Society (2017), DOI: 10.1080/ 14660970.2017.1355790. Curry, G. ‘Up’Ards, Down’Ards and derbies: figurational reflections on intense enmity in pre-modern English football,’ Soccer and Society (2017), DOI: 10.1080/14660970.2017.1399608. Dransfield, J. N. A History of the Parish of Penistone. Penistone: James H. Wood, The Don Press, 1906. Dunning, E. Sport Matters: Sociological Studies of Sport, Violence and Civilisation. London: Routledge, 1999. Dunning, E. and K. Sheard. Barbarians, Gentlemen and Players: A Sociological Study of the Development of Rugby Football. Oxford: Martin Robertson, 1979. [Reprinted with an afterword on ‘The Continuing Commercialization and Professionalization of Rugby Union,’ 247-286. London: Routledge, 2005]. Elias, N. and E. Dunning. Quest for Excitement: Sport and Leisure in the Civilising Process. Cambridge: Blackwell, 1986. Farnsworth, K. Sheffield Football: A History, Volume 1 1857 – 1961. Sheffield: Hallamshire Press, 1995. Harvey, A. ‘“An Epoch in the Annals of National Sport”: Football in Sheffield and the Creation of Modern Soccer and Rugby,’ The International Journal of the History of Sport, 18, 4, (2001): 53-87. Harvey, A. ‘Curate’s Egg Pursued by Red Herrings: A Reply to Eric Dunning and Graham Curry,’ The International Journal of the History of Sport, 21, 1, (2004): 127-131. Harvey, A. Football: The First Hundred Years. The Untold Story. Abingdon: Routledge, 2005. Holt, R. Sport and the British: A Modern History. London: Oxford University Press, 1989. Jacob, G. A. Sheffield Collegiate School. London: Simpkin, Marshall and Co., 1852. Joannou, P. and A. Candlish. ‘The early development of a football hotbed: the onset of the game in Tyne and Wear, 1877-1882.’ Soccer and Society (2017), DOI: 10.1080/14660970. 2016.1276248. Nannestad, Ian. ‘From Sabbath breakers to respectable sportsmen: the development of football in Lincolnshire circa 1855 to circa 1881.’ MA thesis, De Montfort University, 2003. Neill, K. and G. Curry. ‘John Marsh: the tragic story of a great Sheffield footballer,’ Soccer History, 18, (2008): 32-36. Piper, G. Peds of the Past: 1837-1920. Famous athletes and pedestrians with particular reference to Sheffield. Lulu.com, 2012. Post Office Directory of Yorkshire, 1851. Russell, D. ‘“Sporadic and Curious” The Emergence of Rugby and Soccer Zones in Yorkshire and Lancashire, c. 1860-1914,” The International Journal of the History of Sport, 5, 2, (1988): 185-204.Sheffield and Rotherham Independent.The Sheffield Daily Telegraph.Slater’s Commercial Directory for Sheffield, 1887, 1888, 1893, 1895-6. Steele, J. A. The Countrymen: The History of Hallam Football Club: The World’s Second Oldest Soccer Club. 150th Anniversary Edition. Sheffield: JB Printing, 2010. Wallis, P. J. The Sheffield Collegiate School: 1836-1885 – a Biographical Register. Sheffield Local History Collection, Sheffield Library, 1953. Walters, F. The History of Sheffield F.C. : The Oldest Club in the World. Sheffield: Sheffield Telegraph and Star, 1957.White’s Sheffield Trades Directory, 1868 (p. 249), 1879 (p. 562). Wisden Cricketers’ Almanack, 2014. Brown, T. The Official History of Notts. County: 1862-1995. Harefield: Yore Publications, 1996. Curry, G. ‘Sheffield and London, the Early Encounters,’ Soccer History, 31, (2013): 26-33.Football Association minutes, 12 February 1867.Sheffield and Rotherham Independent.The Field: The Country Gentleman’s Newspaper.The Graphic. All England Cricket and Football Journal, April 1878. Allan, J. The Story of the Rangers, 1873-1923: A Jubilee History. Westcliff on Sea, Essex: Desert Island Books Limited, facsimile of 1923 edition, 1996.Athletic Journal.Athletic News. Birley, D. A Social History of English Cricket. London: Aurum Press, 1999. Bone, D. D. Scottish Football Reminiscences and Sketches. Glasgow: John Menzies & Co., 1890. Brown, T. The Official History of Notts. County: 1862-1995. Harefield: Yore Publications, 1996.Burnley Express.Burnley Gazette. Curry, G. ‘Degrading the Game: the Story of the Sheffield Zulus,’Soccer History, 24, (2009): 31-35. Curry, G. ‘Football Spectatorship in mid-to-late Victorian Sheffield,’ Soccer and Society, 8, 2/3, (April/July 2007): 185-204. Curry, G. ‘Playing for Money: James J. Lang and Emergent Soccer Professionalism in Sheffield,’Soccer and Society. 5, 3, (2004): 336-355. Dunning E. and K. Sheard, Barbarians, Gentlemen and Players: A Sociological Study of the Development of Rugby Football. Oxford: Martin Robertson, 1979. (Reprinted with an afterword on ‘The Continuing Commercialisation and Professionalisation of Rugby Union,’ 247-286. London: Routledge, 2005). Dunning, E. ‘The Dynamics of Modern Sport: Notes on Achievement-Striving and the Social Significance of Sport.’ In Norbert Elias and Eric Dunning, Quest for Excitement: Sport and Leisure in the Civilising Process. Oxford: Blackwell, 1986. Elias, N. The Civilising Process. Oxford: Blackwell, 2000. Fairgrieve, J. The Rangers: Scotland’s Greatest Football Club. London: Robert Hale, 1964. Forsyth, R. The Only Game: The Scots and World Football. Edinburgh: Mainstream, 1990. Freddi, C. England Football Fact Book. Enfield: Guinness, 1991.Glasgow Herald. Green, G. The History of the Football Association. London: Naldrett Press, 1953. Knight, I. Rorke’s Drift 1879. London: Osprey, 1996. Lamming, D. A Scottish Soccer Internationalists’ Who’s Who: 1872-1986. Beverley: Hutton Press, 1987. Northwich and Knutsford Guardian. Oliver, G. The Guinness Record of World Soccer. Enfield: Guinness, 1992. Phythian, G. Olympic F. C.: The Forgotten Giant-Killers. London: New Millennium, 1998. Reid, D. A. ‘The Decline of Saint Monday 1766-1876,’ Past & Present, 71, (May 1976): 76-101. Reid, D. A. ‘Weddings, Weekdays, Work and Leisure in Urban England 1791-1911: The Decline of Saint Monday Revisited,’ Past & Present, 153, (November 1996): 135-163.Sheffield and Rotherham Independent.Sheffield Daily Independent.Sheffield Daily Telegraph. Sparling, R. The Romance of the Wednesday. Sheffield: Leng and Co., 1926. Steele, J. A. The Countrymen: The History of Hallam Football Club: The World’s Second Oldest Soccer Club. 150th Anniversary Edition. Sheffield: JB Printing, 2010.The Athlete. Wallis, P. J. The Sheffield Collegiate School: 1836-1885 – a Biographical Register. Sheffield Local History Collection, Sheffield Library, 1953. White’s General and Commercial Directory of Sheffield, 1879. The All England Cricket and Football Journal and Athletic Review, No. 13, Vol. II, April, 1878.Sheffield and Rotherham Independent. Sheffield Daily Telegraph.Sheffield Trades Directory 1852. Curry, G, and E. Dunning. ‘The problem with revisionism: how new data on the origins of modern football have led to hasty conclusions.’ Soccer and Society, 14, 4, (2013): 429-445. Elias, N. What is Sociology? New York: Columbia University Press, 1978.